Trader Joe’s does many things well. Produce, is not one of them. 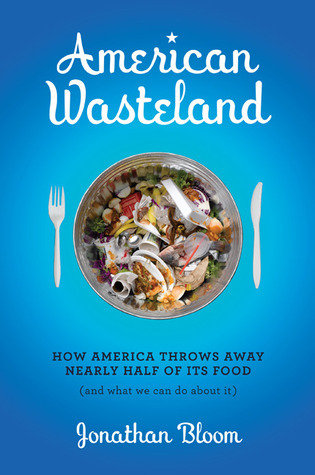 My main complaint is that the grocery chain encourages waste the same way CostCo or Sam’s Club does–in bulk. 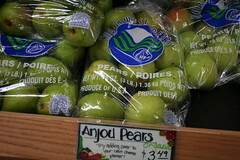 Most fruits and vegetables come shrink wrapped or bagged with others. When it lumps three bell peppers together, it is packaging waste. Need a pear for a recipe? Or maybe three for around the house? Too bad, buy a bag of ten. By my count, the store only sells seven unwrapped, single produce items. And what happens when one or two in that bag of ten goes bad? Hopefully, they are donated to a food recovery group, as I observed at a Trader Joe’s in Santa Cruz, Calif. If not, they’re trashed. Not having a butcher, deli or seafood counter creates household waste because you can’t buy custom amounts. If you want less than a pound of shrimp, you’re out of luck. Same goes for cuts of meat, slices of provolone, etc. Single adults and small families are the ones most affected here. Finally, the abundance of chopped, bagged produce, which breaks down quicker than whole produce, leads to more waste. Once you break the chemically-aided seal, this stuff is like a ticking bomb. This entry was posted in Household, Supermarket. Bookmark the permalink. Both comments and trackbacks are currently closed. Thanks so much for the informative and thought-provoking website/blog! I’m glad someone is paying attention to this stuff. True, that is one solution, Laurie. But it sounds like a nightmare of planning who wants what, what time everyone can get together, paying for your share, etc. It seems off that a store’s packaging strategy should cause so much trouble on our part. Plus, individually wrapping two peppers, for example, causes needless packaging waste. I think the loveliest compost heaps are the least fed ones. And I’m with you–I end up putting things like a half of a cucumber in my compost pile more often than I wish. The answer is to not shop a these places! Jonathan has begun to hit upon the solution. The real answer: if your household is smaller than the quantities dictated by the “bulk” vendor, then you should not buy from them! It’s cheaper, and much more environmentally conscious, for you to buy what you NEED (e.g. ONE apple versus a dozen) from a local green grocer. Use your head!! TJ’s packaging of produce in wads of cellophane and styrofoam is disgusting and ridiculous. So surprising, since they do most other things well. But TJ has changed, at least since opening several years ago in Chicago — their foods are now much more processed and many contain HFCS. I complained once online that their turkey meatballs contained the stuff and their reply: TJ doesn’t claim to be a health food store.